This is my take on a suitable portable power supply for the Microsoft Kinect. I'm not saying it's better than anyone else's, just that its cheap. 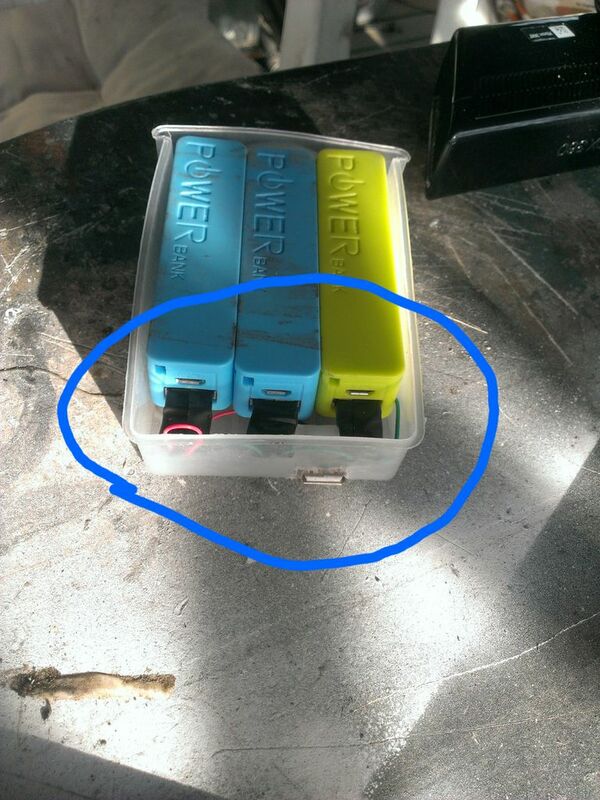 the "Power Bank" cells are rated at ~4.7vDC at 1800 mA. That's enough juice for it, and my preliminary test got 5 (five!) hours of use out of it! Measure the hole and cut it out (I got away with an exacto knife, but a Dremel will do too.) Slightly smaller than the USB plug. Connect each Power Bank to each one of the male USB plugs, and insert the batteries in the drawer. It will be a tight fit, but it does, without breaking the drawer... To secure the drawer, I used a self-tapping machine screw on the front left of the drawer. Unscrew 4 (four) screws underneath the Kinect, and add Velcro just slightly longer than the length of the base, including the curved edge, fold it over the edge, and then screw the cover back on, (more support for the Velcro.) add a couple of pieces on the top of the drawer. Mount the Kinect on to of the drawer, and then make your connections (yea, I know, I made the power connection longer than the USB connection, silly me...) Then connect to PC. I used NLite, and (brain fart!) Microsoft Kinect SDK v1.8 and (louder brain fart!) openNI, skeltrak (all which you can find doing a Google search...) and voilà! A self-contained portable power supply for your Kinect! Step 9: Update! I've Streamlined the Package! !